A few dishes had been planned for us by the boss, so we just picked out a couple of small things to start with. 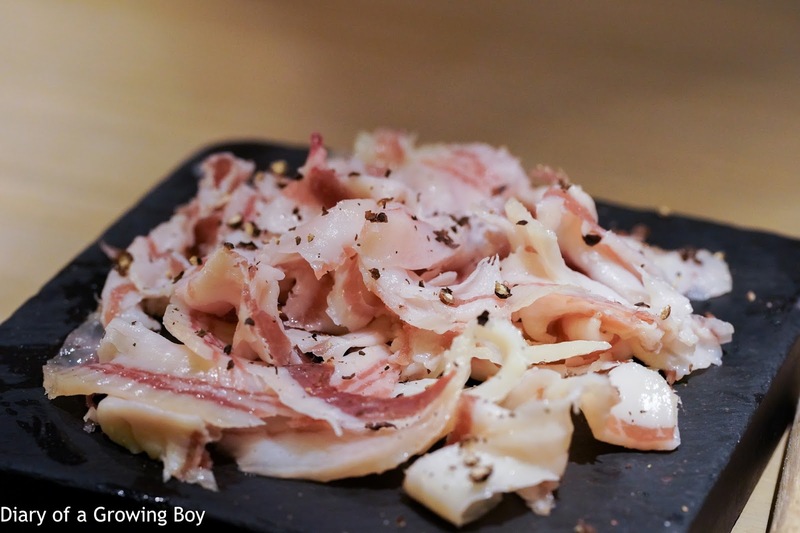 Culatello di zibello "Massimo Spigaroli" - while we were waiting for the dishes we ordered, The Man in White T-shirt got busy hand-slicing this for us. This comes from black pigs and is very flavorful, and paired very well with the Champagne. 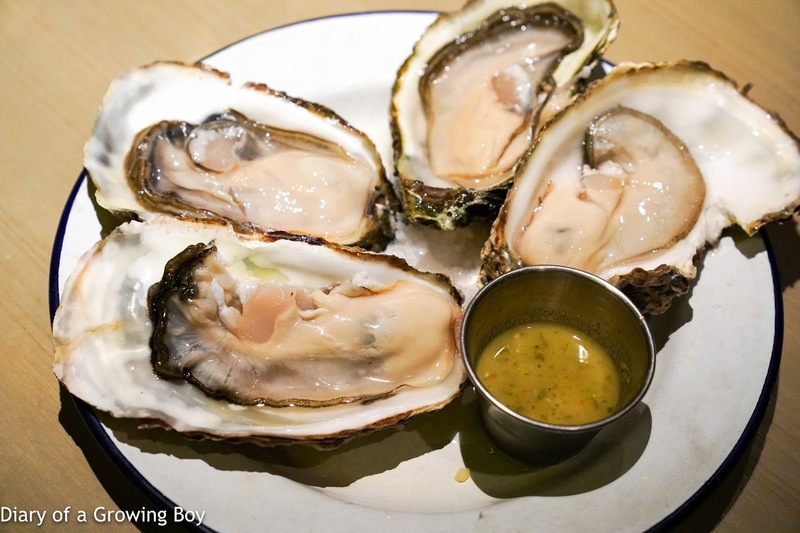 Jumbo Dutch oysters - plenty of seawater here, and somewhat briny in terms of flavors. And they were big. Pancetta - we saw The Man in White T-shirt hand-slicing from this big roll, and this was the result. 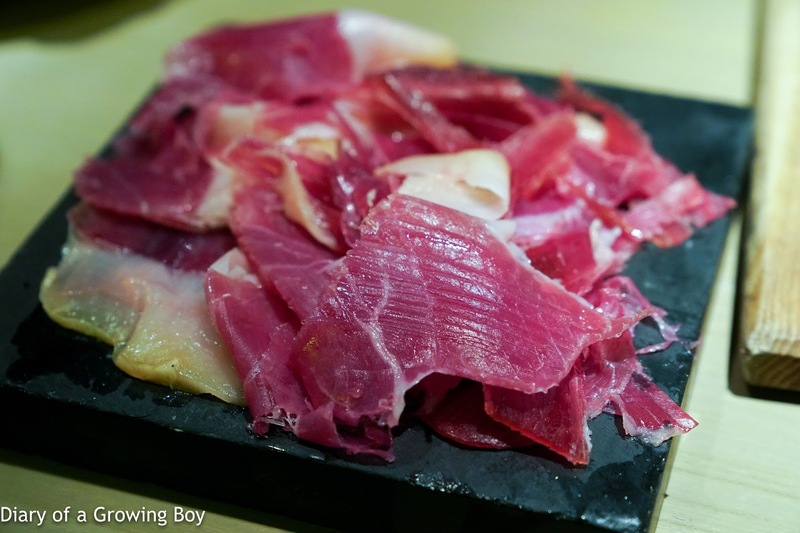 What's not to like about cured pork fat?! Very nice with cracked black pepper. 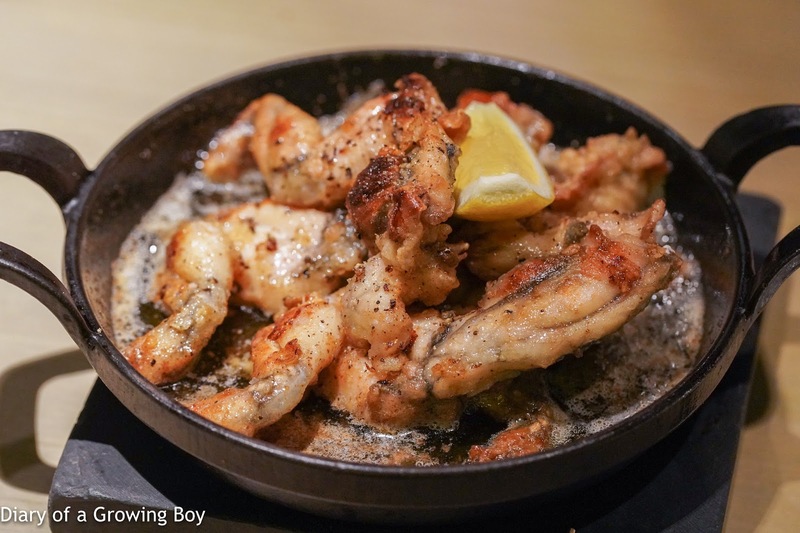 Fried firefly squid - I can never get enough of firefly squid, and I just had to order this when I saw it on the menu. Simply delicious! Crispy exterior while retaining the soft interior. Frog legs meuniere - these were very, very big frogs' legs. Cooked in tons of butter and sprinkled with piment d'espelette. So, so good. 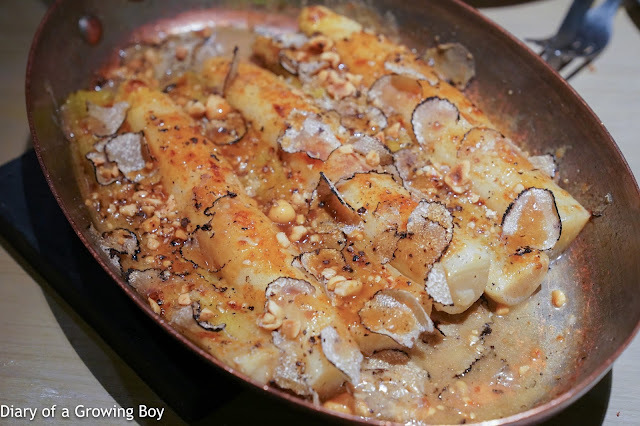 White asparagus / leeks - these spears of French white asparagus were very, very big. Cooked together with leeks in chicken stock, and served with shaved summer truffle and crushed hazelnuts. So, sooooo beautiful. Scarbreast tuskfin - I don't think I've ever had these scarbreast tuskfin (石馬頭魚) before, but then The Man in White T-shirt has introduced me to quite a few species of fish over the years. Given that 休漁期 officially started today and fishermen aren't going out for fresh catch, only three of these was available for the four of us... but that was still plenty. The flavors of the fish itself were wonderful, and certainly more interesting than turbot. Very nice texture, too. 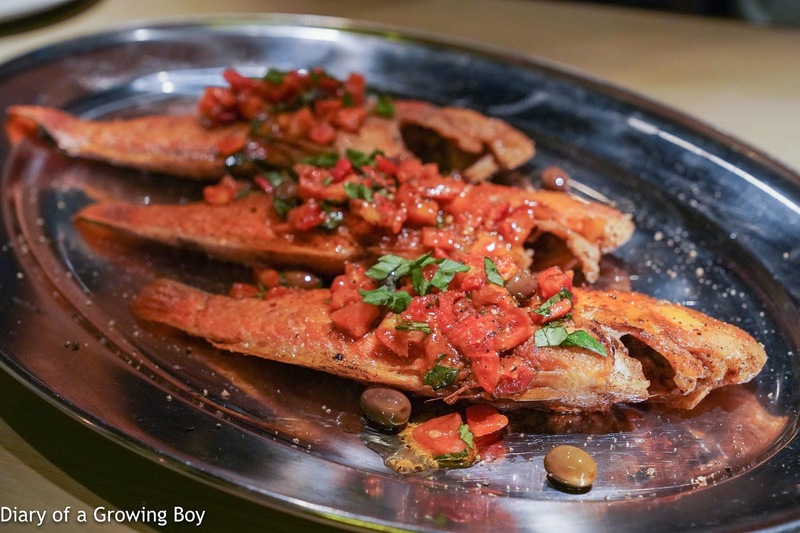 The fish was pan-fried with their thin scales on, then the provençal-style sauce was added. I am normally not one to go after olives, but the ones on my plate were really something. 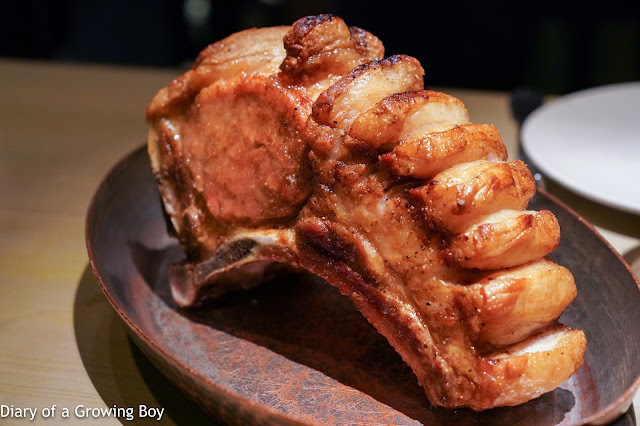 The two people who had worked for Alain Ducasse could certainly see the inspiration. Noir de Bigorre pork chop - I had originally wanted something else, but was told that the boss had reserved this for me instead. None of us were about the complain when we saw this beautiful hunk of fatty pork! 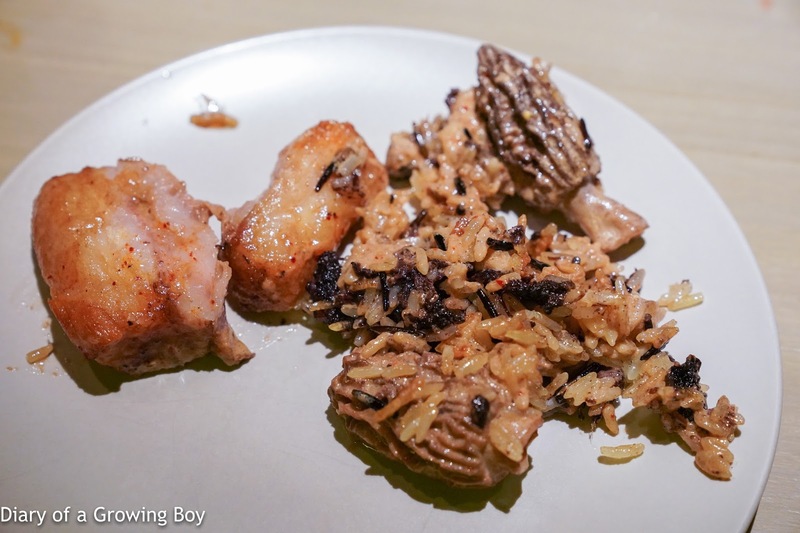 This was then cut up and served on a bed of wild rice pilaf, with giant morel mushrooms - some the size of dinner spoon bowls - along with a single egg. But there was a lot more to the rice than initially meets the eye! There were, in fact, bits of boudin basque mixed in. This made our chef friend pretty happy, as he grew up in Pays Basque. Well, I was pretty damn happy, too! 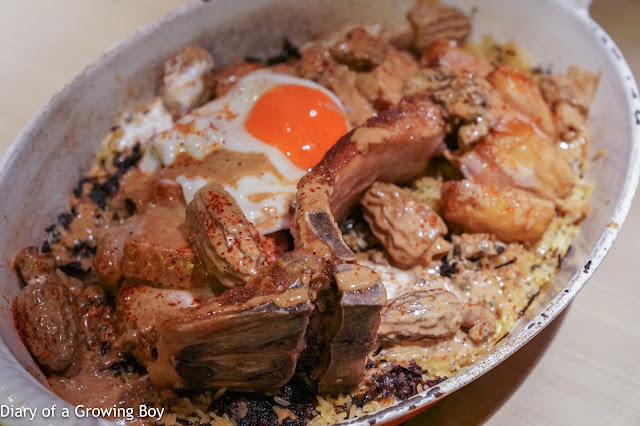 The combination of fatty pork, morels in cream sauce, blood sausage, runny egg, and wild rice was simply awesome! 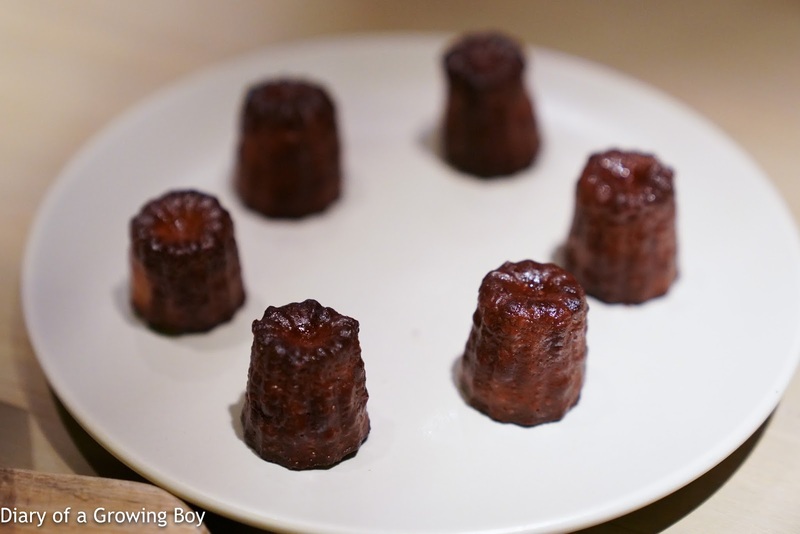 Canelé - for regulars like myself, we have always known that this place serves up some of the best canelés in town. Tonight we had two first-timers who were raised in France - one of them who is the chef de cuisine at a 3-star restaurant - marveling at the fact they were eating these really well-made canelés in a small and unassuming restaurant hidden in a back alley in Hong Kong. 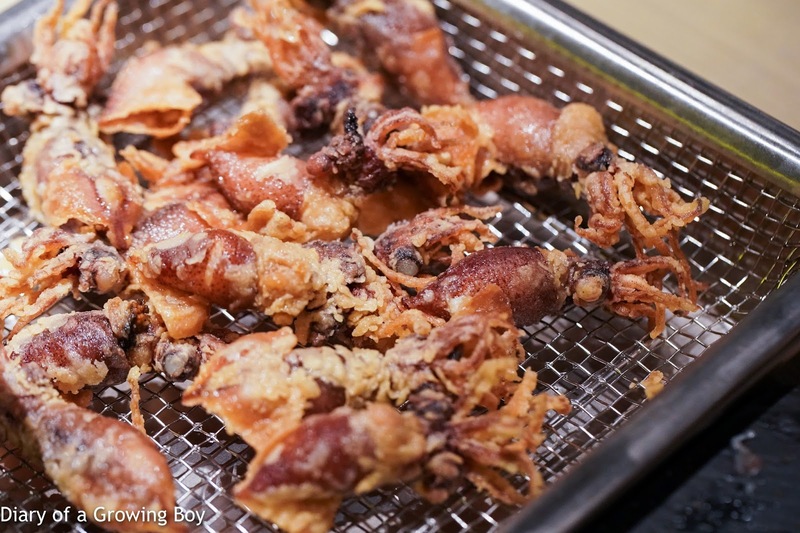 To them, the crunchy exterior, the moist center, the flavors of the alcohol in the batter... everything was just as it should be. I had told Sébastien that he didn't need to bring any wine for tonight, but of course he did anyway... so the four of us found ourselves with 6 bottles on the table! 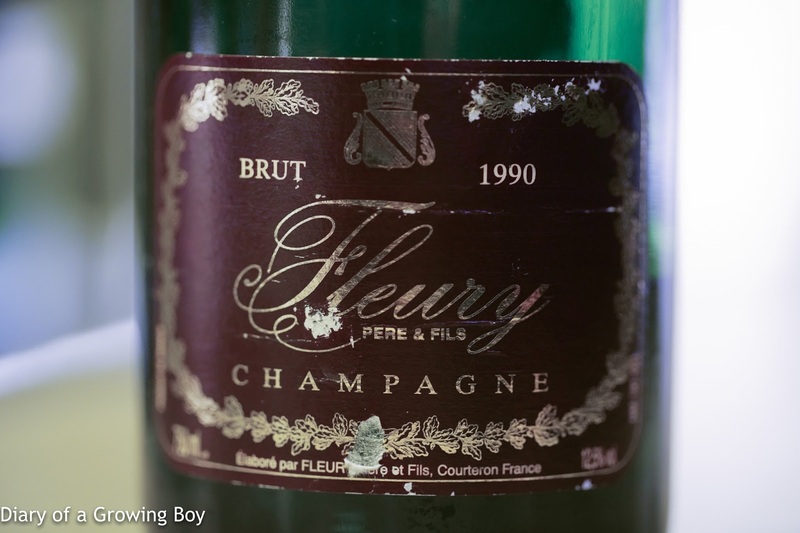 1990 Fleury - very ripe and caramelized, yeasty, lovely. Mature with good depth on the palate. 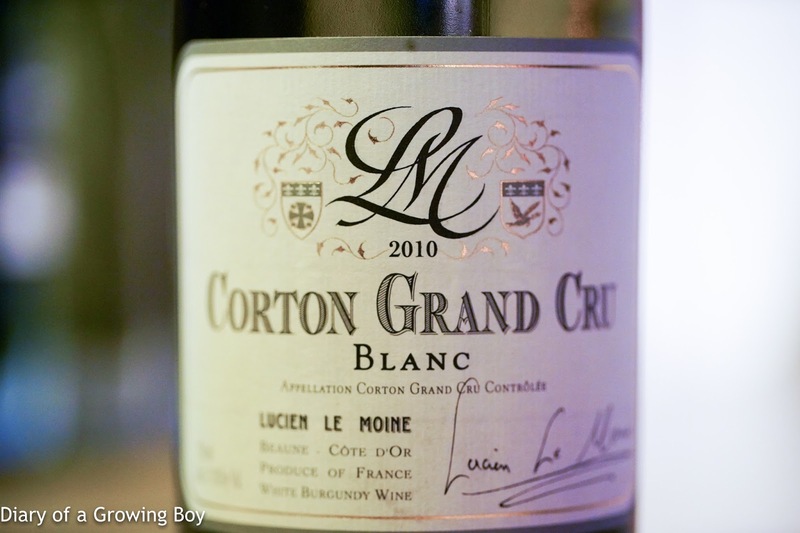 2010 Lucien Le Moine Corton Blanc - pretty ripe and caramelized, with a little marzipan and lemon. Good acidity balance. 1999 Rayas Blanc - initially very tight and alcoholic. Took a while to open up in the decanter. 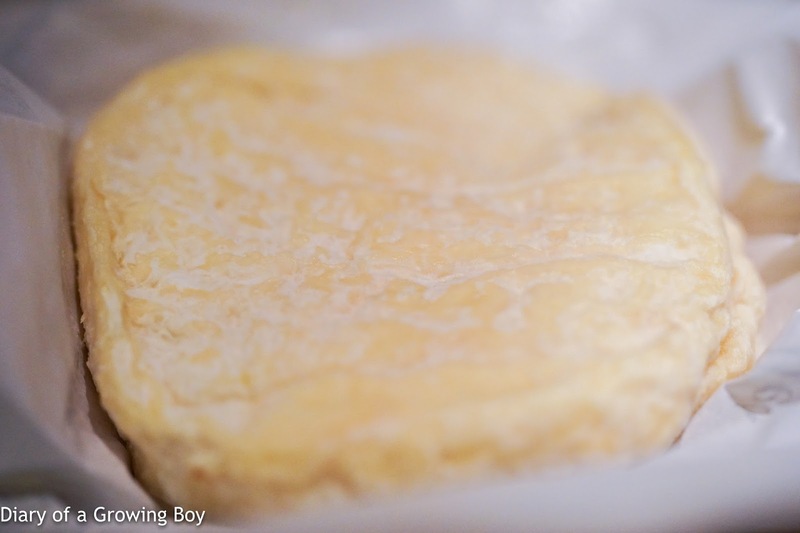 Damn ripe on the palate, with acetone and a little polyurethane. 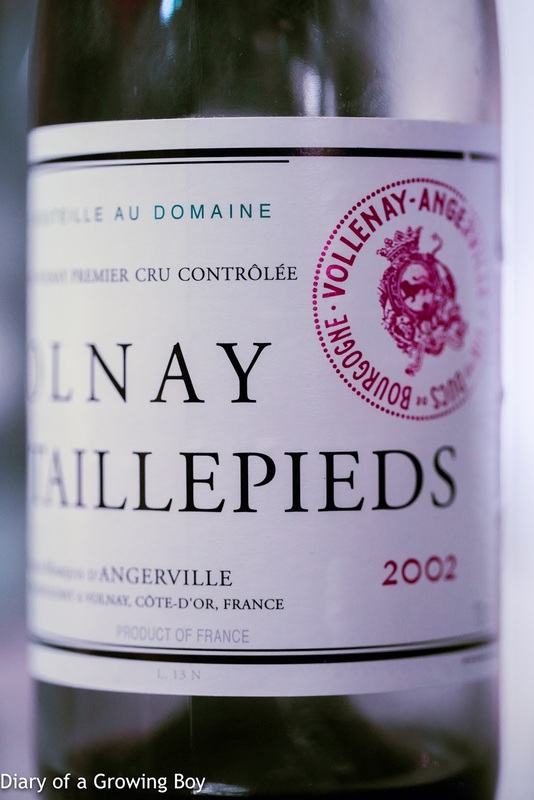 2002 Marquis d'Angerville Volnay 1er Cru Taillepieds - good acidity balance, still some tannins there, but not very open. 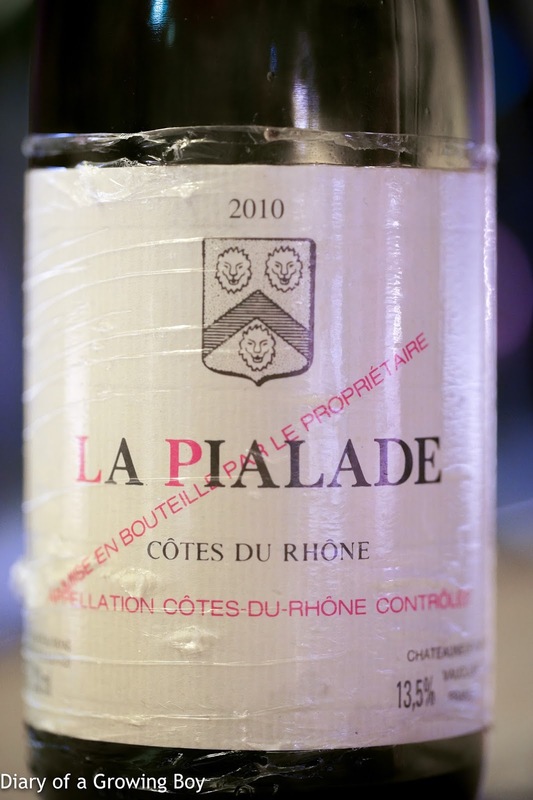 2010 Rayas La Pialade - I would have pegged it as a Prieuré-Roch. Incredibly beautiful and fragrant nose, with plenty of rose and floral notes, almost lychee, leather, and a little smoke. Taipei Michelin hop: three stars?! Puh-leeze! Singapore hop 2018: ¿Cómo estás?